Home > Your Questions > What Is Shrink Wrap Sheeting For Scaffolding? Shrink wrap sheeting is typically used as an alternative to conventional scaffold sheeting in order to encapsulate scaffold cladding for the temporary weather protection or containment of construction work. Shrink wrap sheeting is not necessarily right for every construction project but it is typically chosen by scaffolders or contractors who need a more robust scaffold sheeting, that will not detach in strong winds or become loose and saggy over time. Shrink wrap also provides a completely sealed skin around a work area. But, what exactly is shrink wrap and how is different to ‘traditional’ scaffold sheeting? Traditionally, scaffold sheeting, used for the last 20-30 years to encapsulate scaffold structures, has consisted of individual sheets of reinforced plastic. 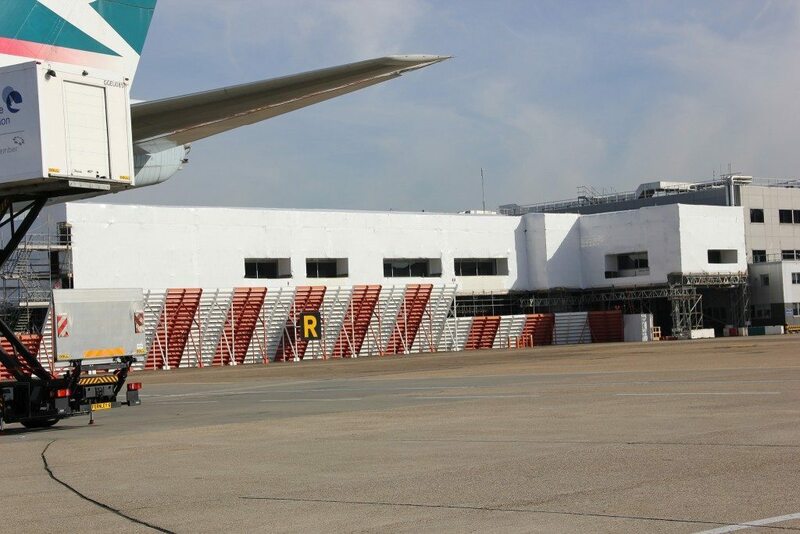 This sheeting, supplied in rolls, is typically applied in 2-3m high strips around the sides of a scaffolding. The individual sheets overlap each other and are secured using elasticated bungee ties. Although this traditional type of sheeting works well for some applications, the gaps between individual sheets means that it can be difficult to contain dust, water, paint fumes and other pollutants and because it is difficult to fix tightly, over time the sheeting can become loose and has a tendency to flap and detach in windy conditions. Shrink wrap is a strong and durable LDPE plastic cladding, usually supplied as a 7m wide x 15m long sheet which is multi-folded on to a roll weighing around 30Kg for ease of transport and handling. Shrink wrap films used for scaffold encapsulation are typically 300-320 microns thick and although it is possible to manufacture scaffold shrink wrap films in any colour, they are typically supplied in white or transparent / clear. Firstly, when subject to heat the shrink wrap sheeting begins a ‘biaxial’ shrink process, (which means it shrinks in every direction), thus giving a taught covering capable of withstanding the most adverse of weather conditions. Secondly, because sheets of scaffold shrink wrap are joined by heat welding them together, it is possible to create a ‘continuously bonded skin’ over even the largest or most awkwardly shaped scaffolds without the holes or gaps typical of traditional sheeting. Most scaffold shrink wrap films are flame retardant as standard to EN13501 or LPS1207 & LPS1215. Because scaffold shrink wrap is shrunk ‘drum tight’ it creates an extremely robust cladding that does no flap or ‘self destruct’ in high winds. This means less going back to repair detached sheeting and more happy clients & repeat business. 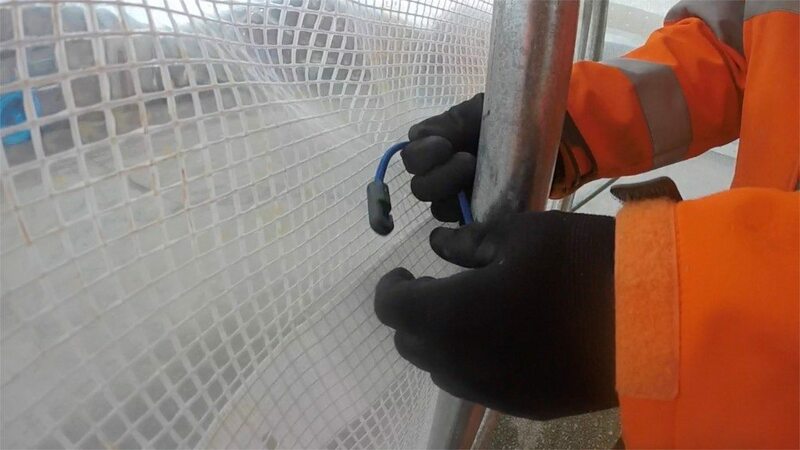 The ‘shrink to fit’ and ‘heat sealed joints’ characteristics of shrink wrap cladding make it useful for scaffolding projects where full encapsulation is required or where the detachment of scaffold sheets could have serious consequences. Scaffold shrink wrap is manufactured to contain UV inhibitors and ethylene-vinyl acetate (EVA) to prevent it becoming brittle at low temperatures and when used long-term. 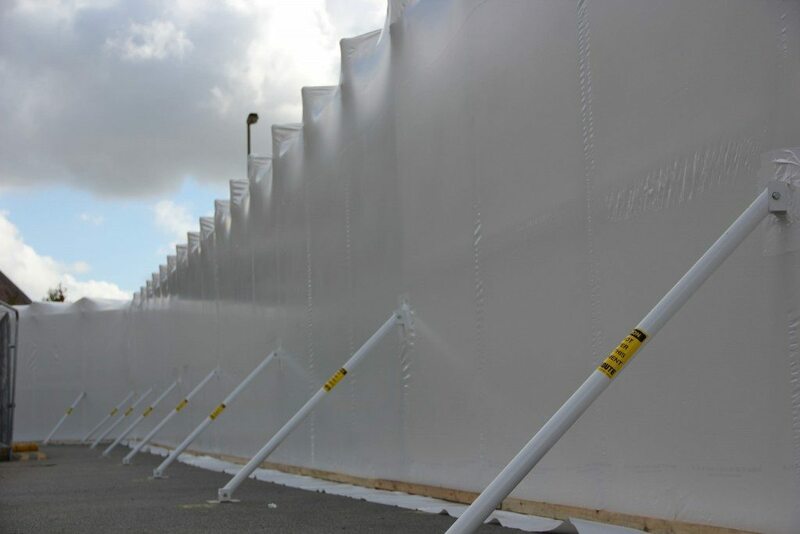 As joins between individual sheets of shrink wrap are heat welded to create a sealed and bonded joints, shrink wrap sheeting is ideal for creating highly effective environmental containment or weather protection. Shrink wrap is particularly good at adapting to awkward shapes as it can be cut and heat welded ‘in situ’. Should it be necessary to gain access through the sheeting, such as for craneage, scaffold sheeting can be cut open and re-sealed to maintain 100% containment. Zipped access doors can be installed to allow access through the sheeting. After use, scaffold shrink wrap is easy to remove from the scaffolding. Manufactured from virgin resins it is valued by recycling companies. Typically scaffolding shrink wrap will be recycled in agricultural films. How Much Does Shrink Wrapping A Scaffolding Cost? The cost of shrink wrapping a scaffolding will depend on a number of factors. However, as a ‘ball park’ figure, we charge around £6 per square metre for a full ‘supply and fix’ service. Alternatively, we supply materials and equipment (+ training). If you are interested in learning how to install shrink wrap sheeting, costs for materials only will be around £1.50 per square metre.